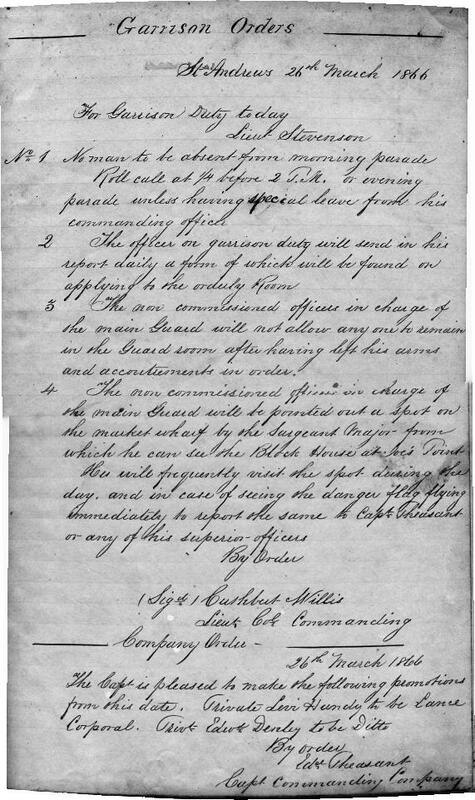 Click on a number below to see page. 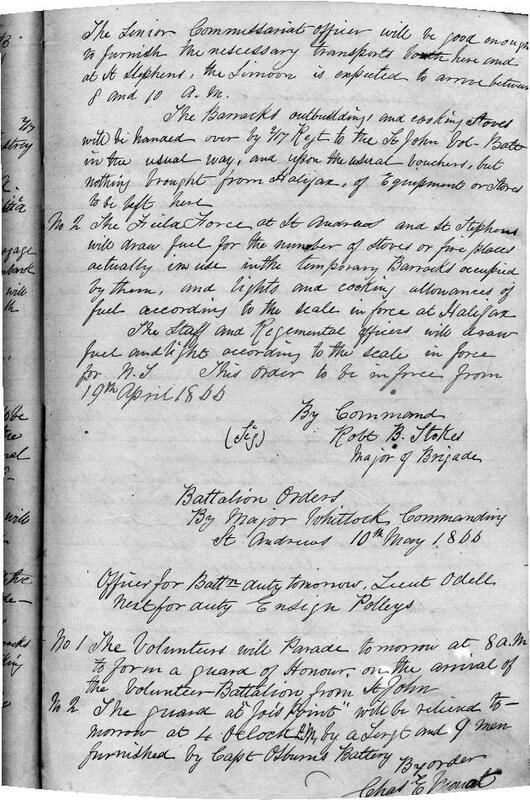 Following the Civil War in the United States, militant Irish Americans believed that many of the people living in the British Provinces to the North were ripe for revolt and would welcome an invading army. 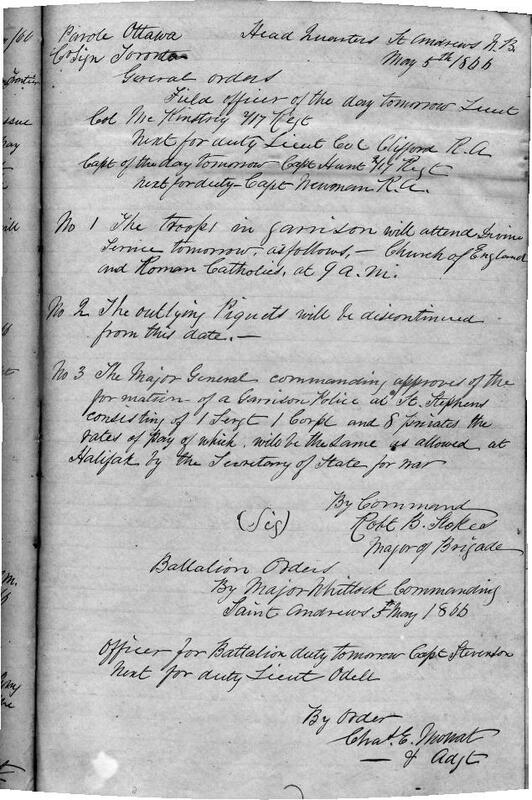 In 1866 a group of Fenians, as they were called, gathered along the Maine Shore from Calais to Eastport and actually occupied tiny Indian Island between Deer and Campobello Islands. 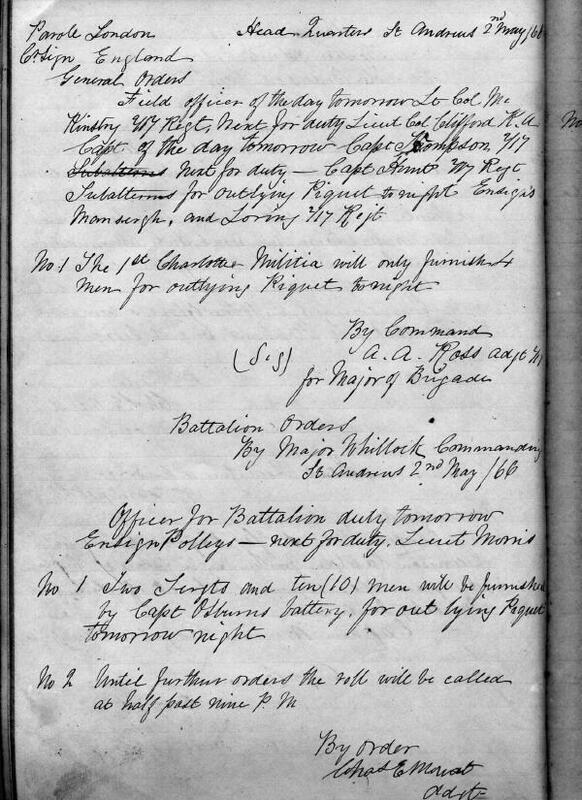 A force of British regulars and local militia was ranged against them on the New Brunswick side. 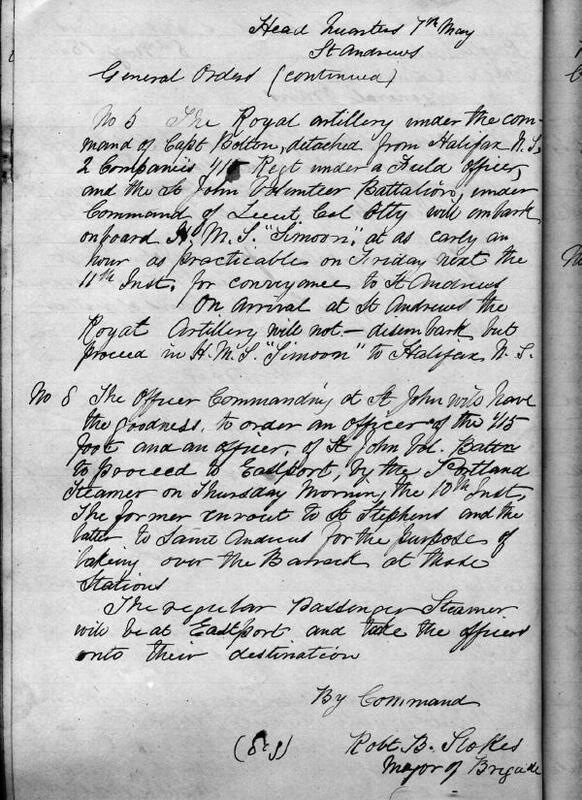 There were skirmishes at St. Stephen and Calais but the enemy never reached fortified town of St. Andrews, the Shiretown of Charlotte County. 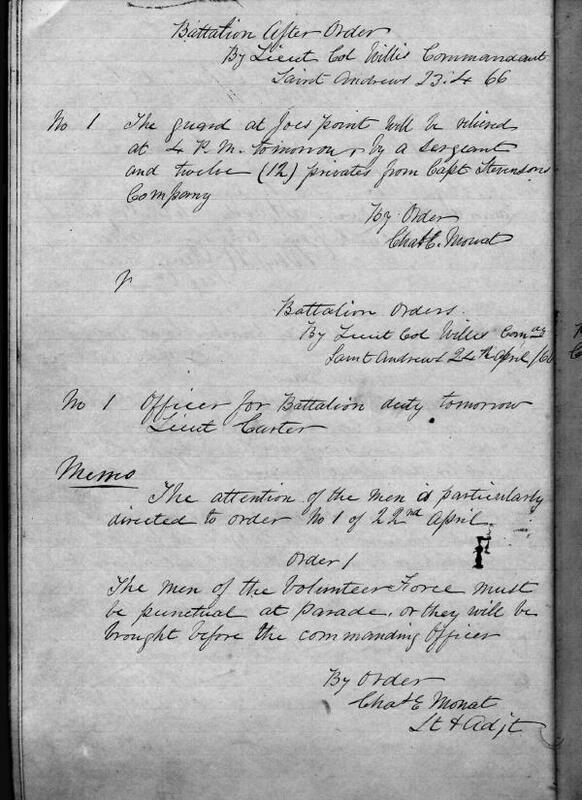 Their activity at Robbinston, Maine, could be observed from the blockhouse at Joe's Point at the mouth of the St. Croix River. 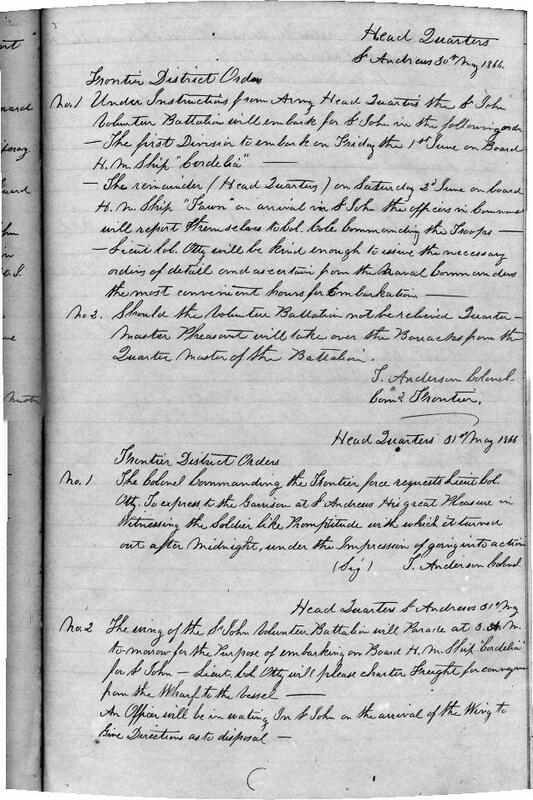 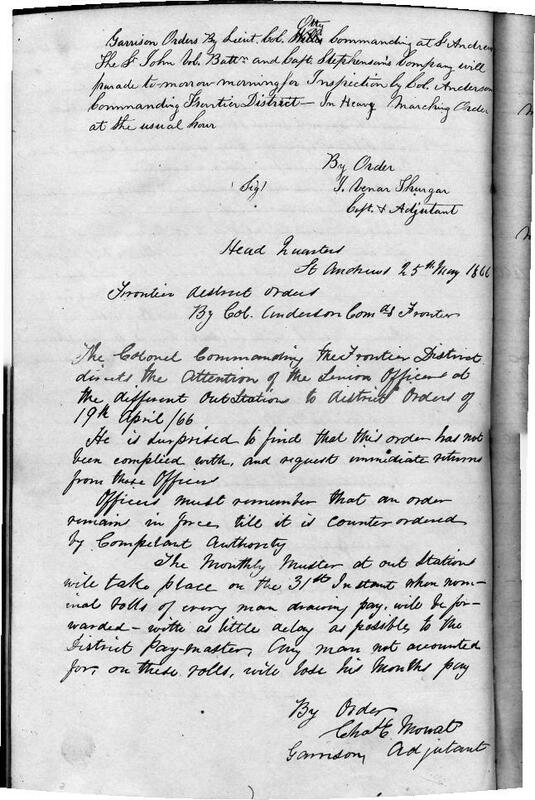 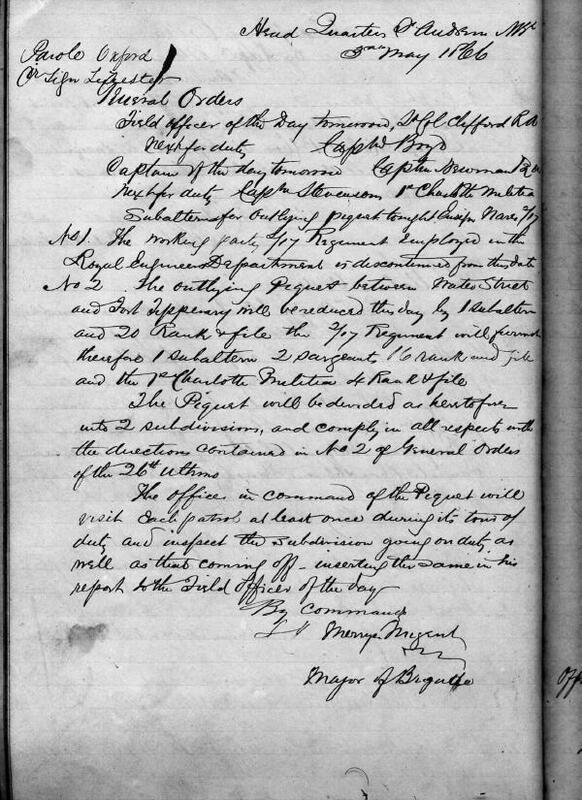 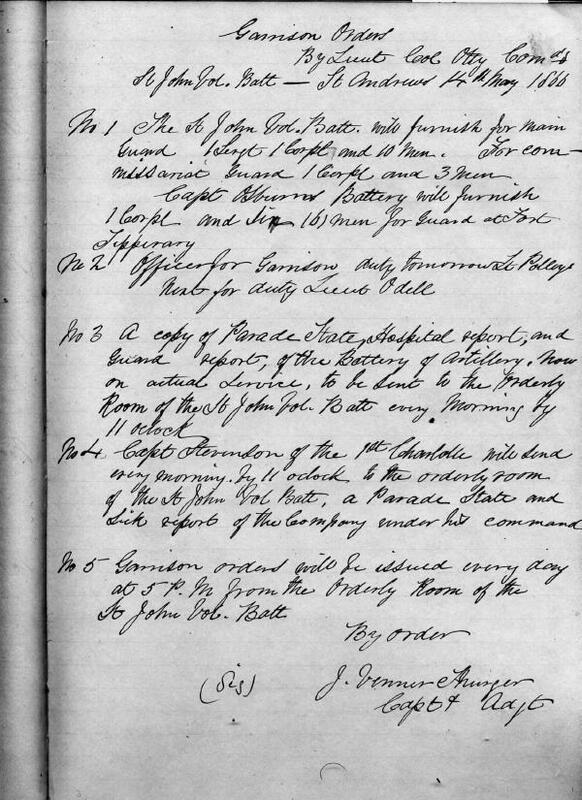 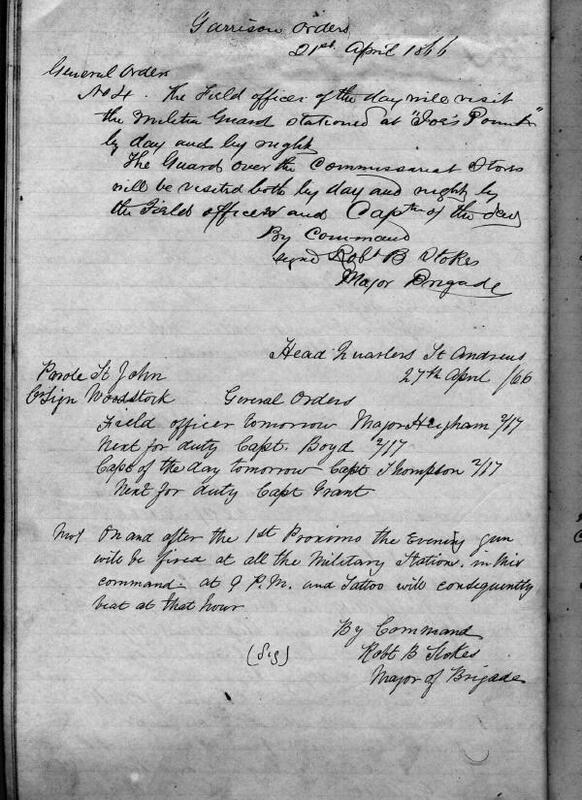 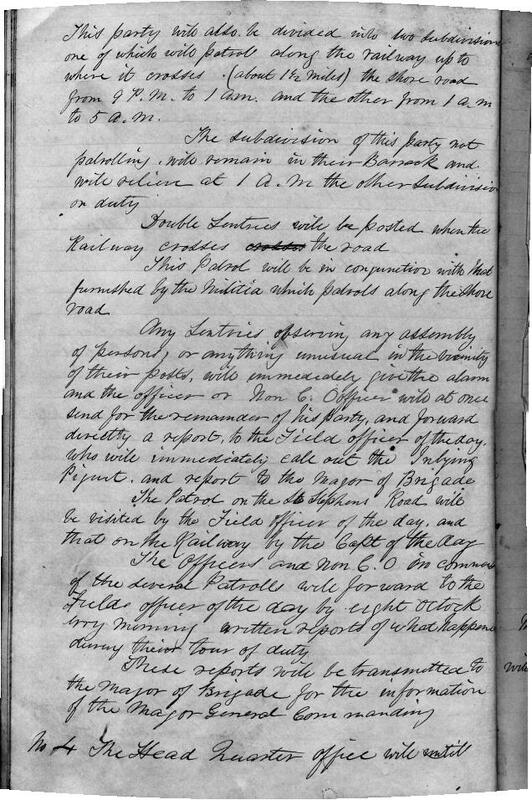 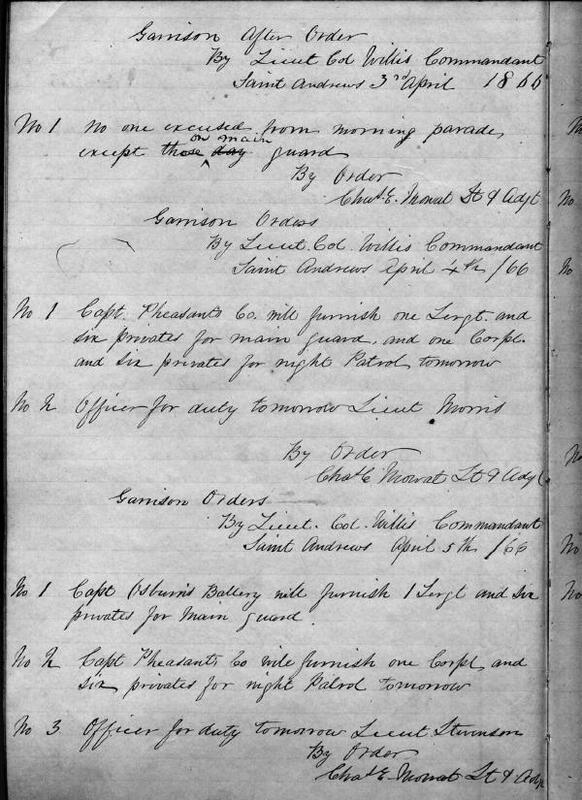 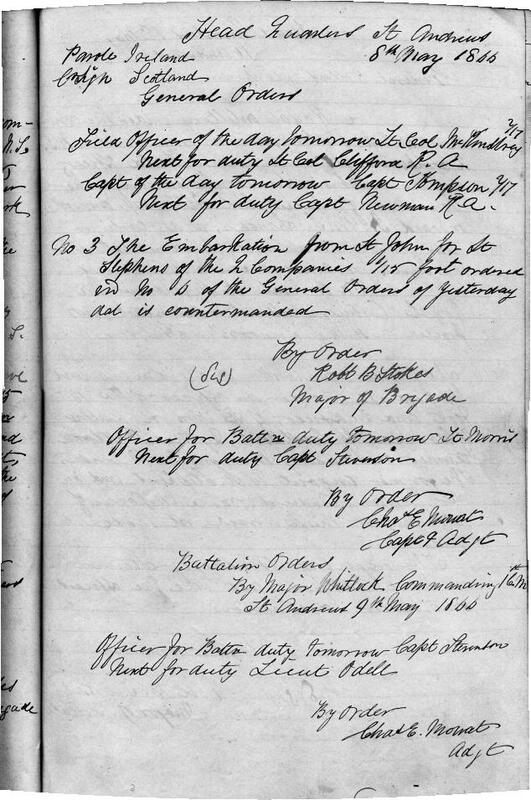 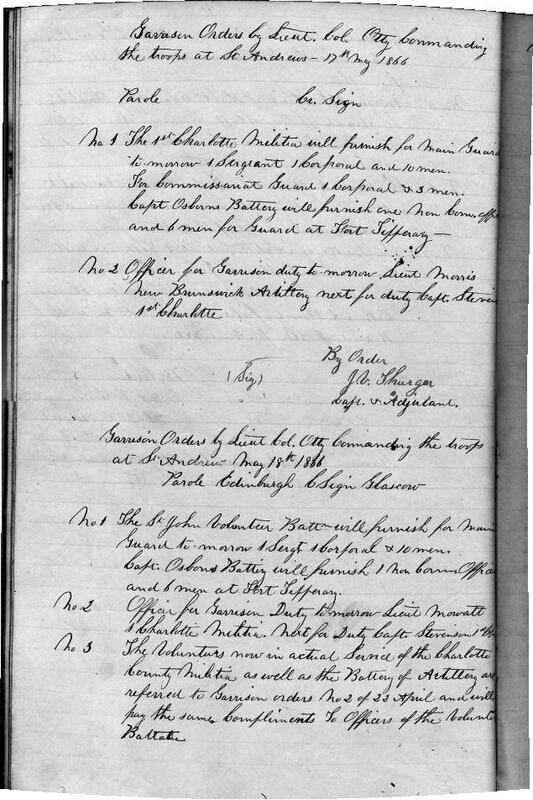 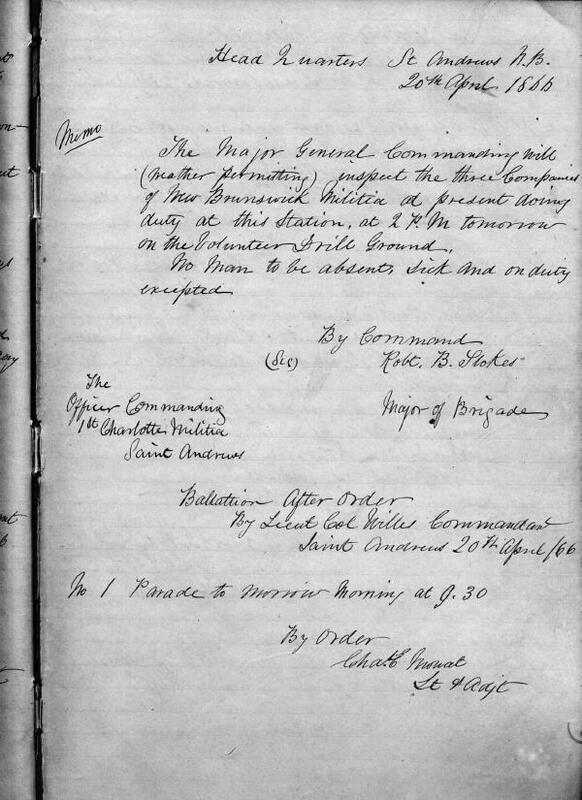 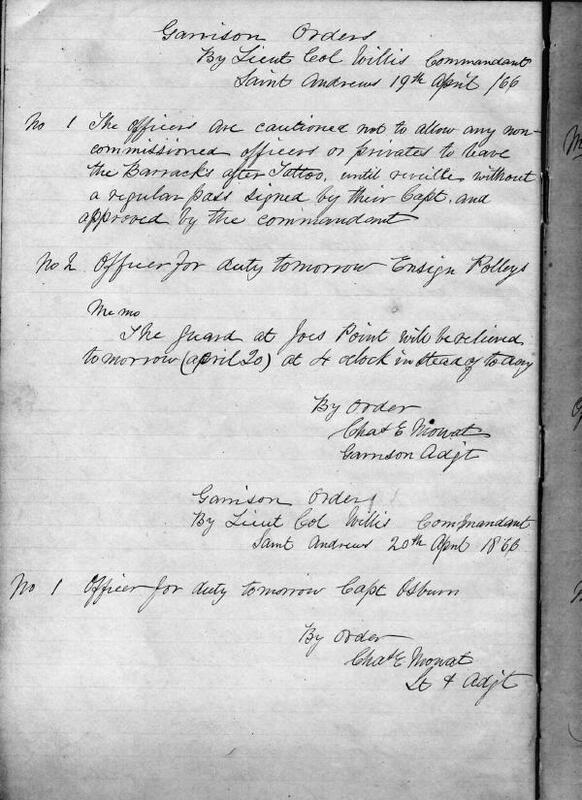 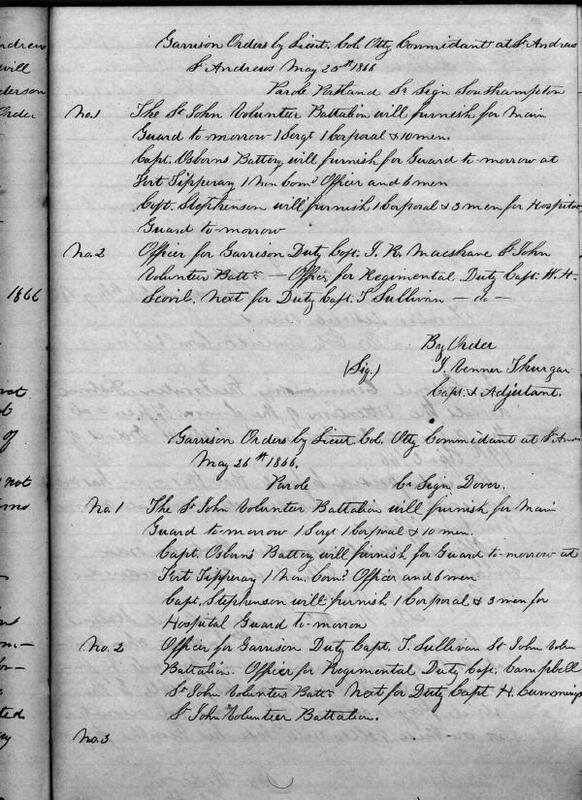 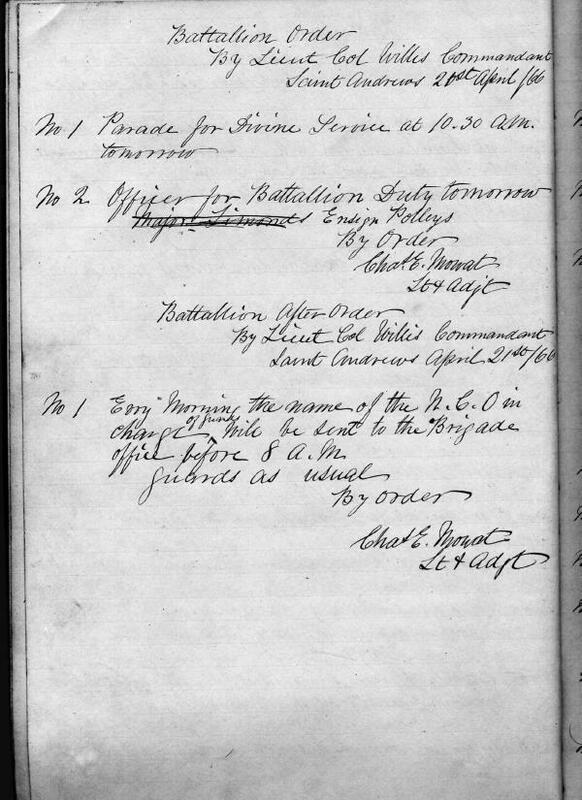 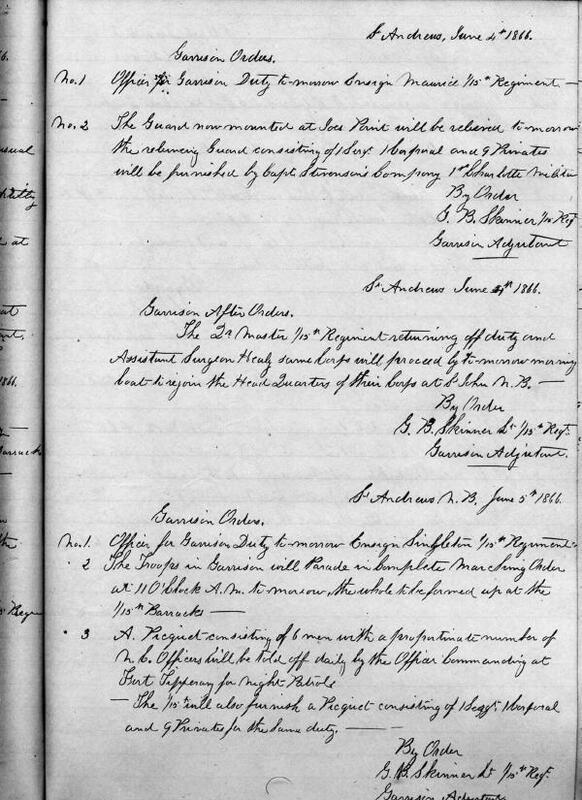 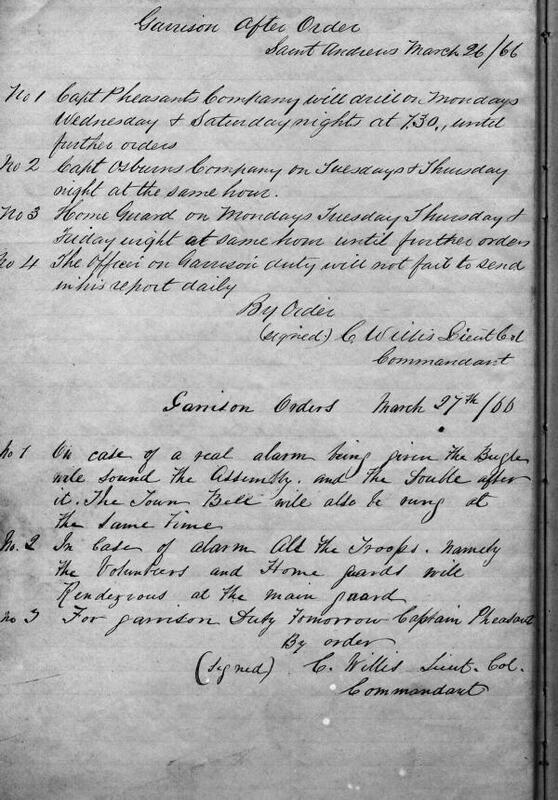 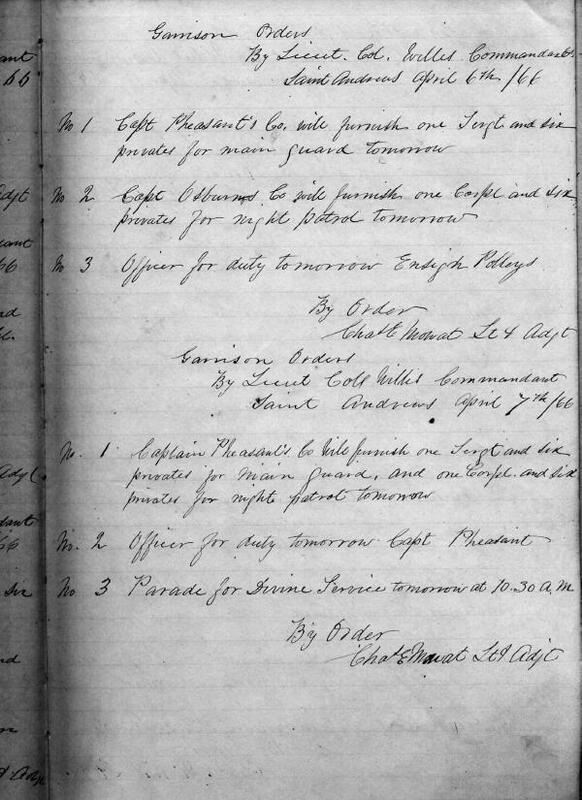 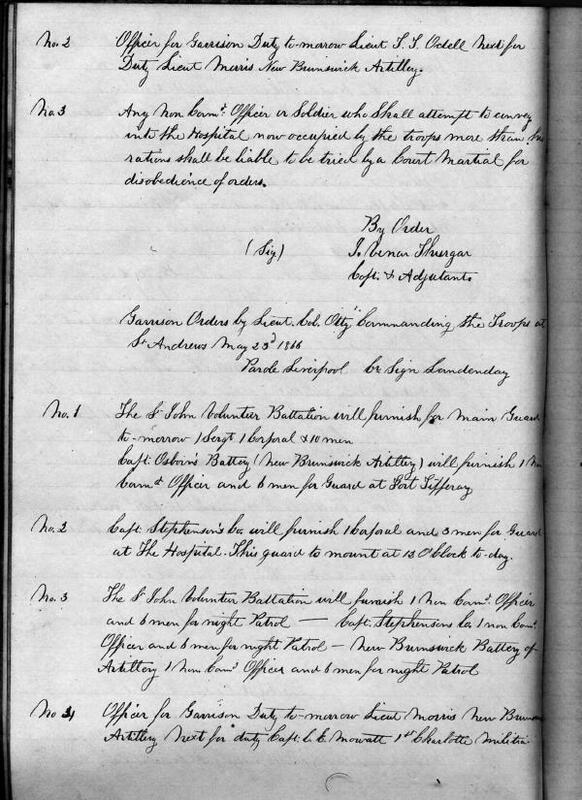 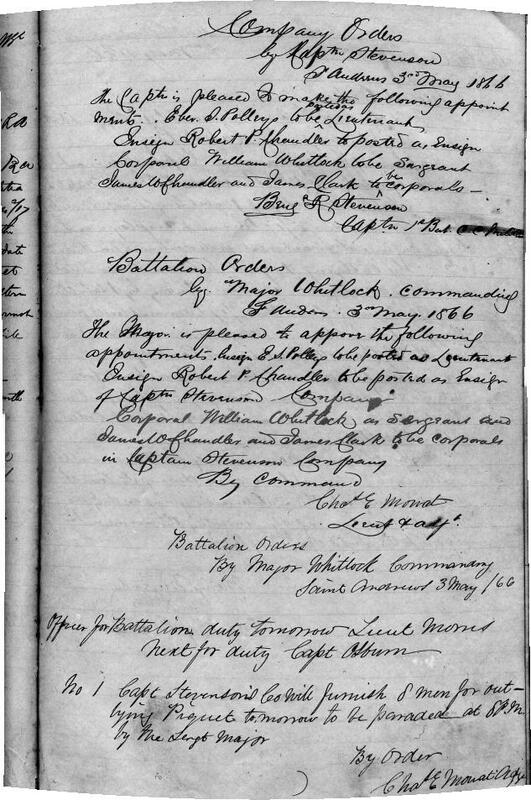 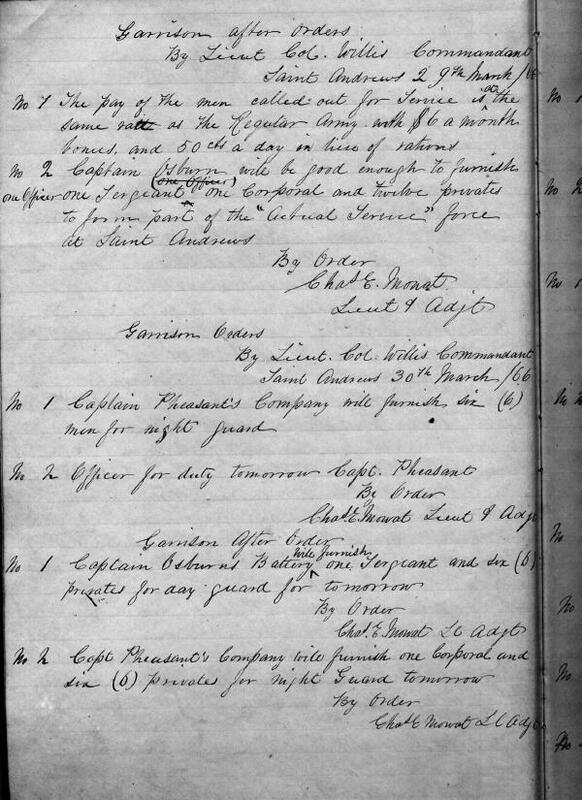 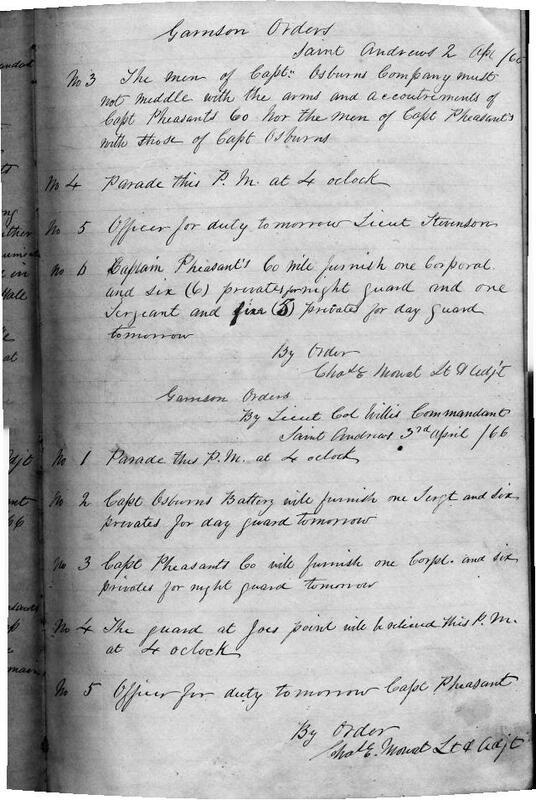 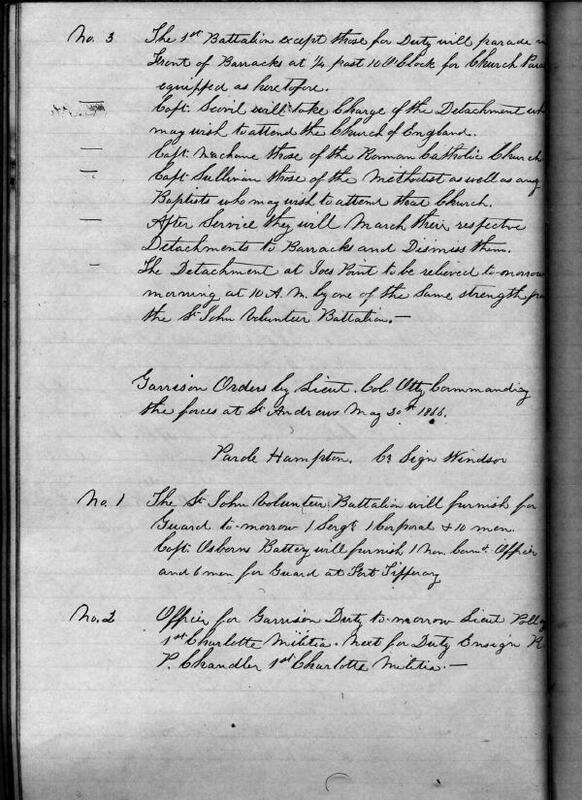 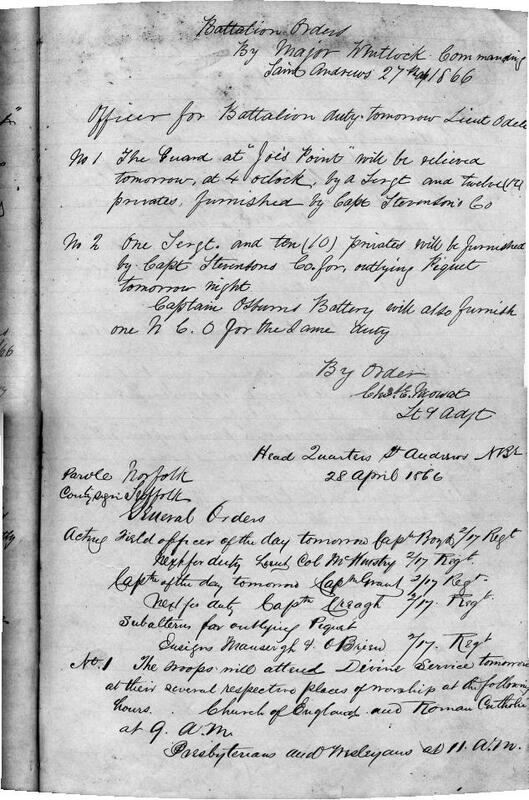 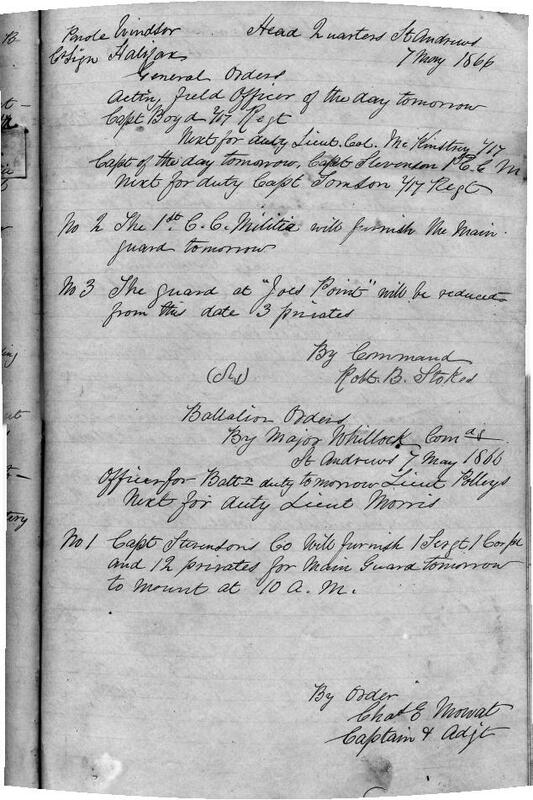 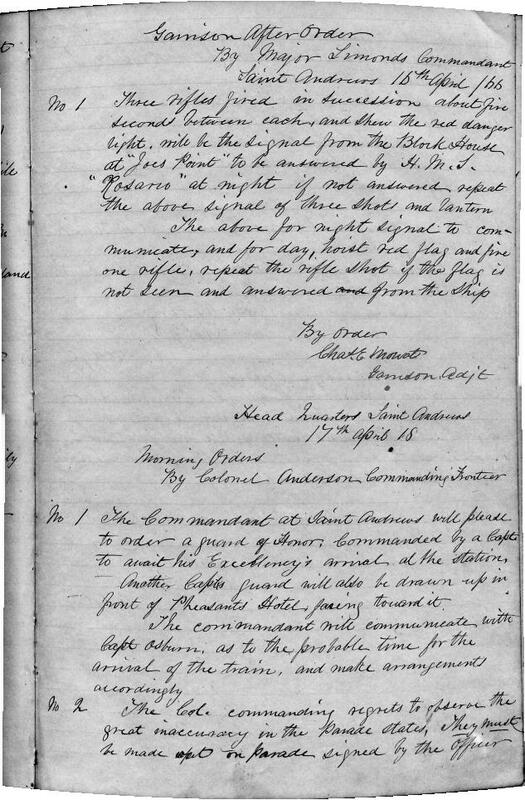 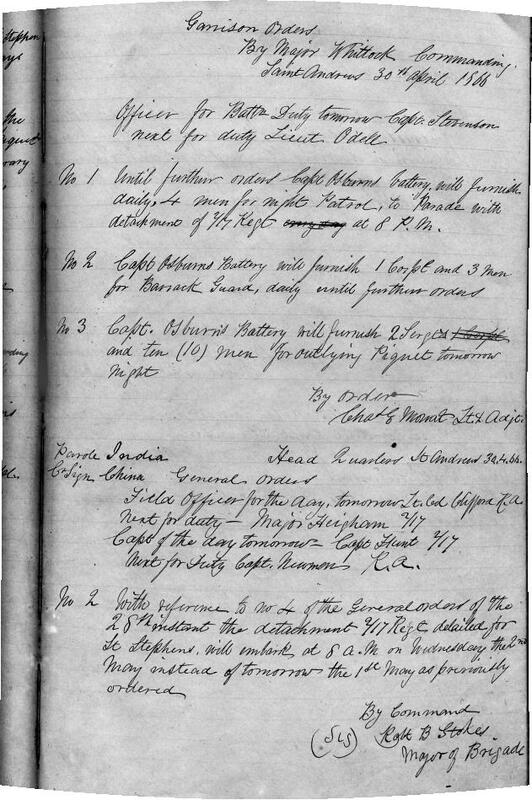 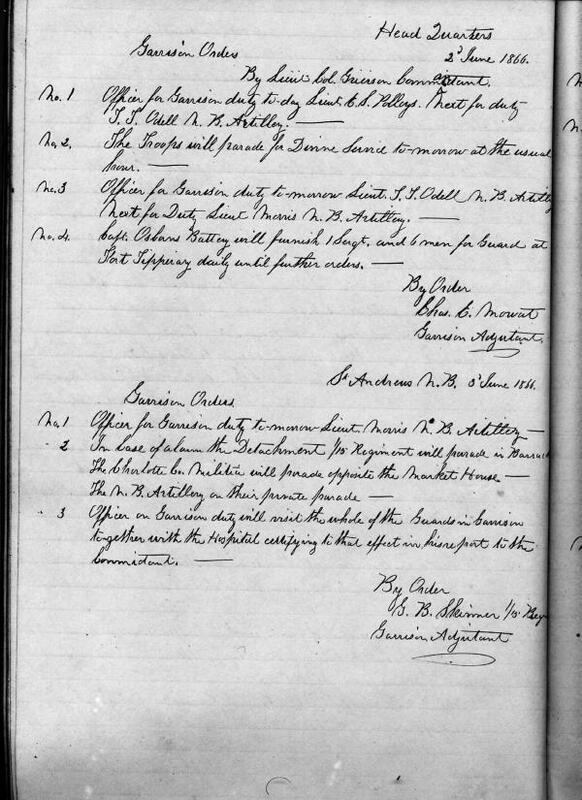 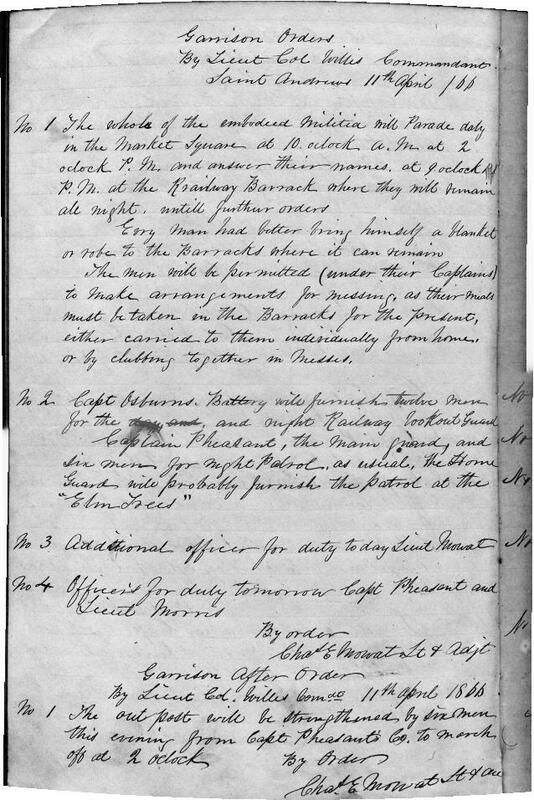 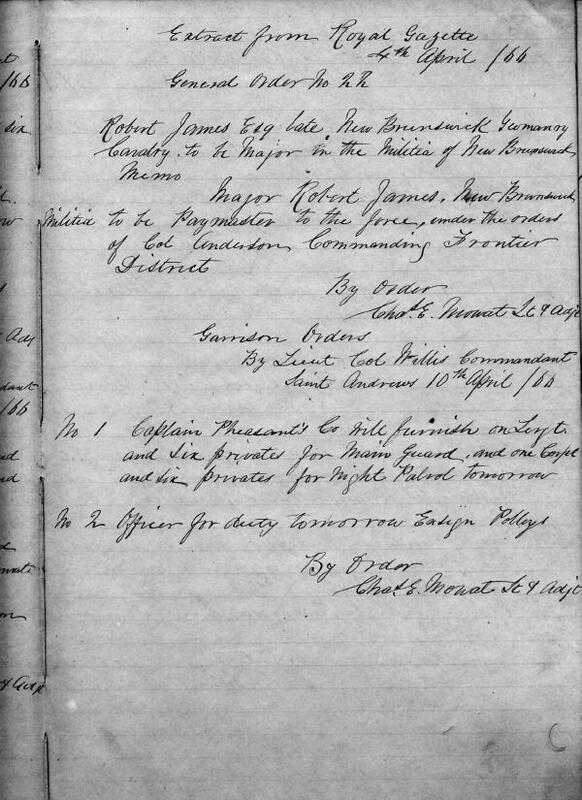 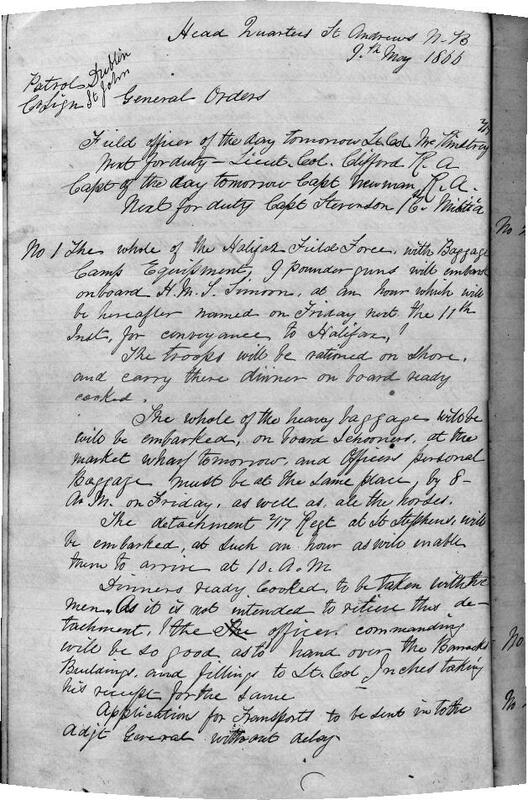 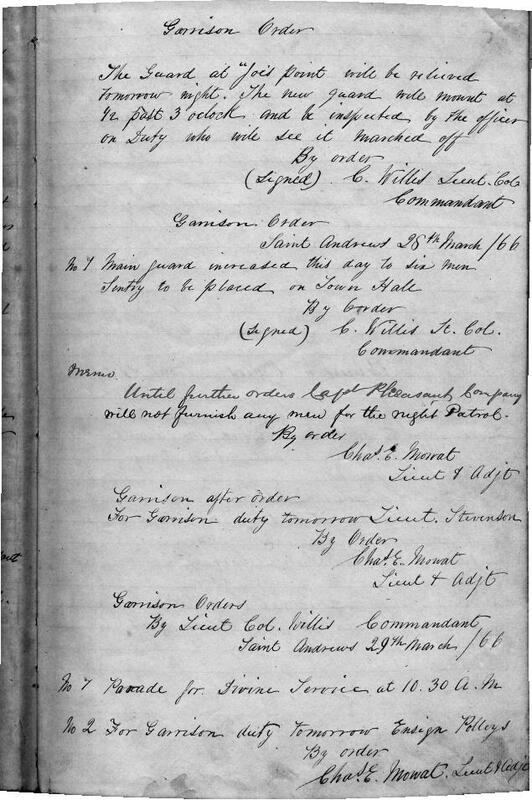 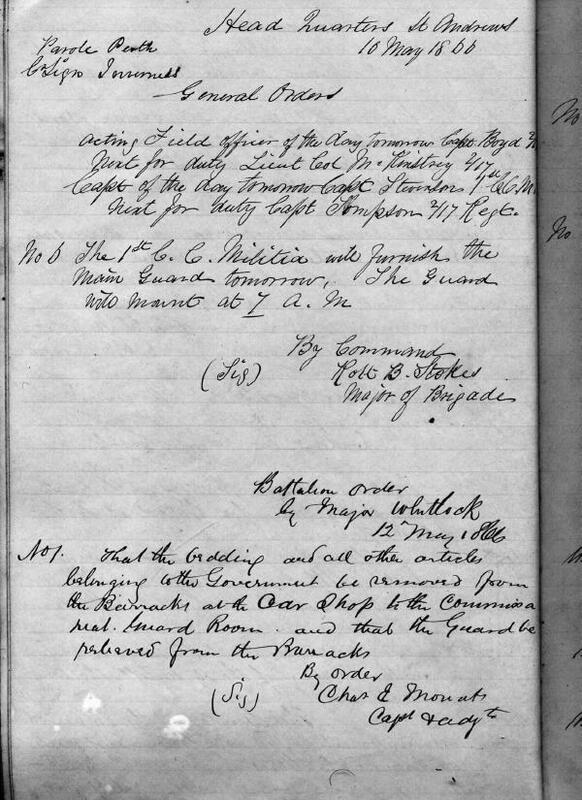 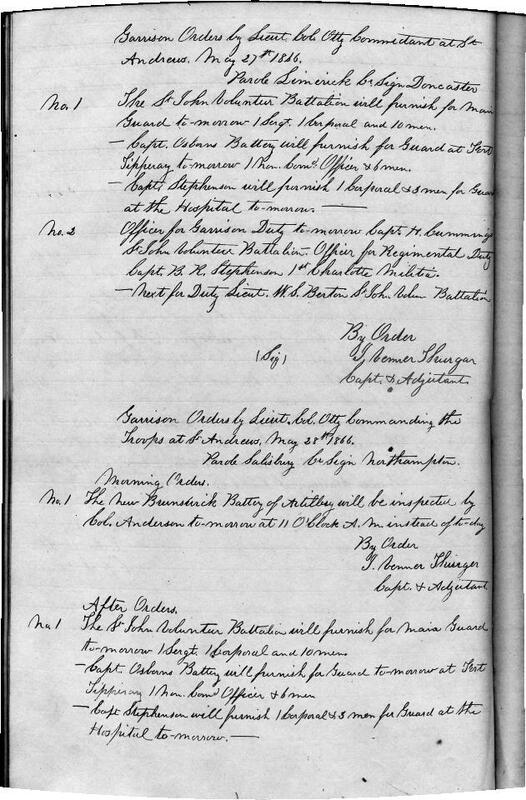 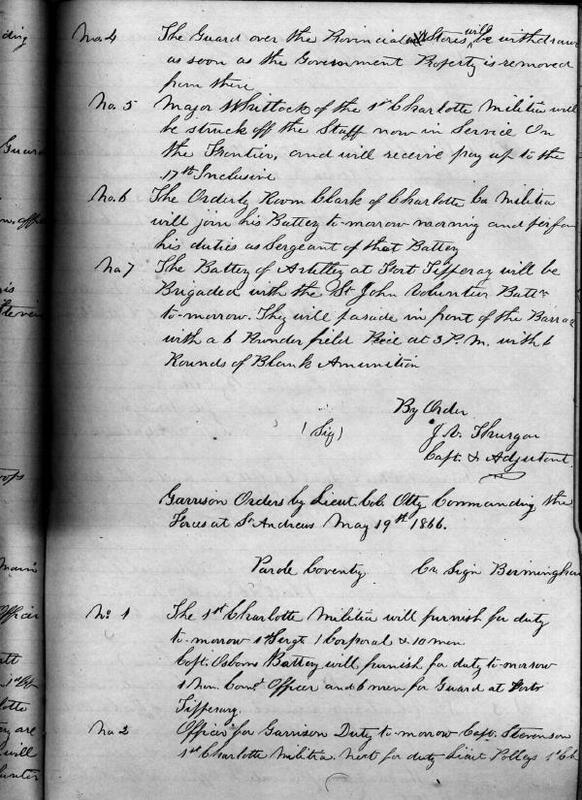 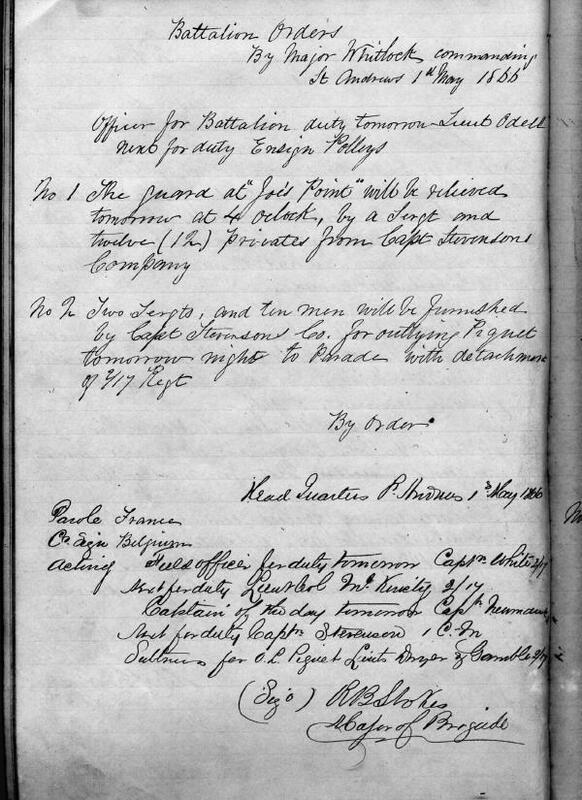 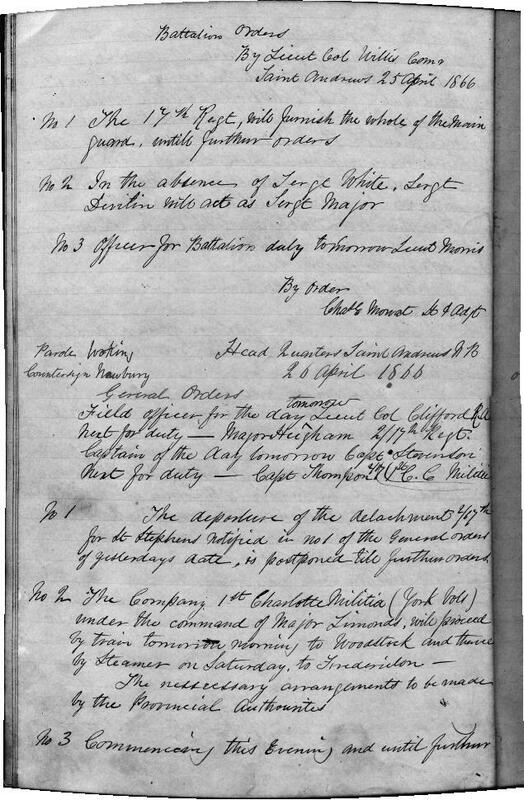 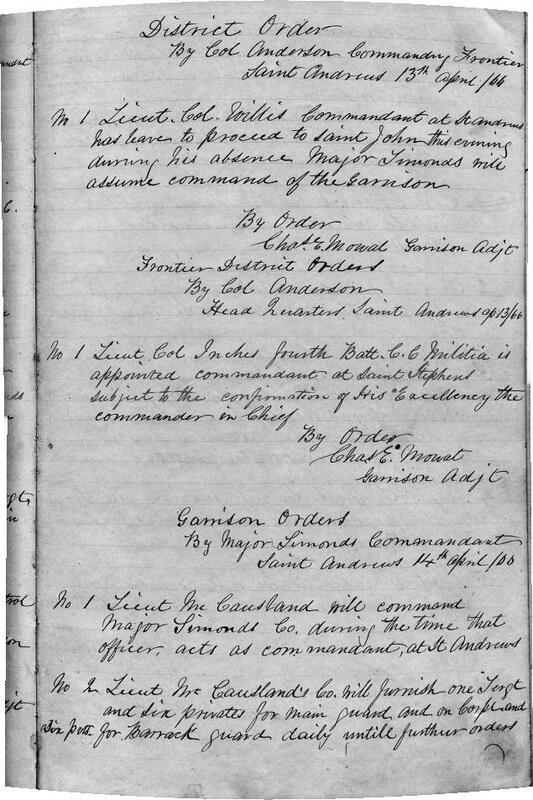 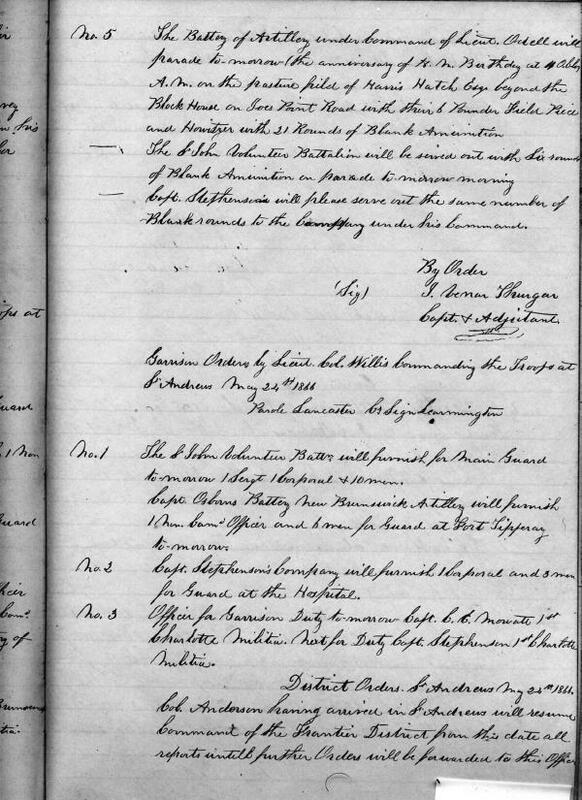 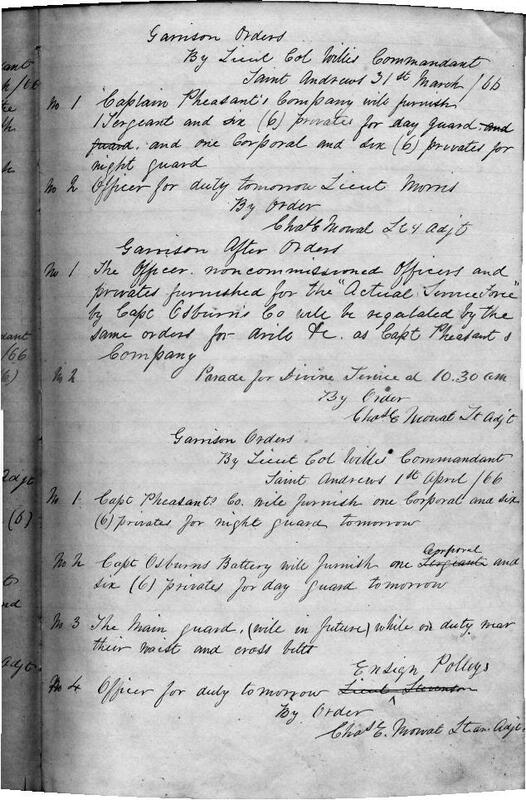 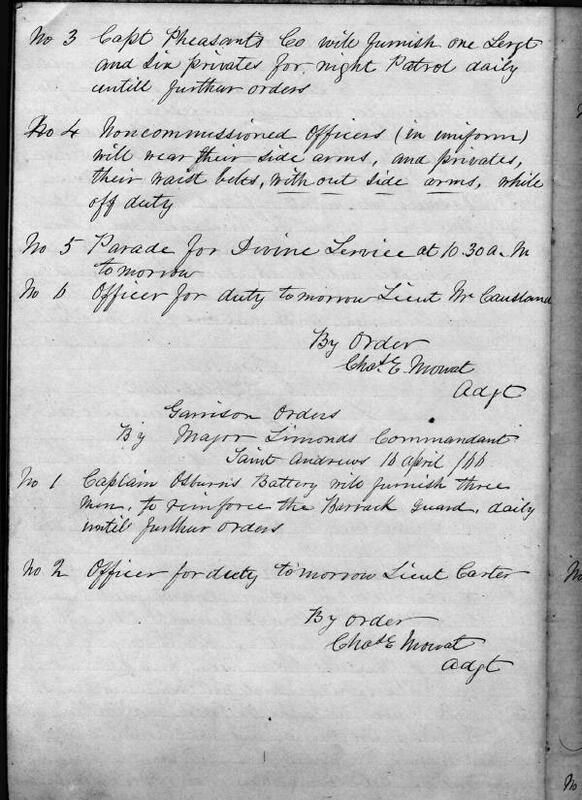 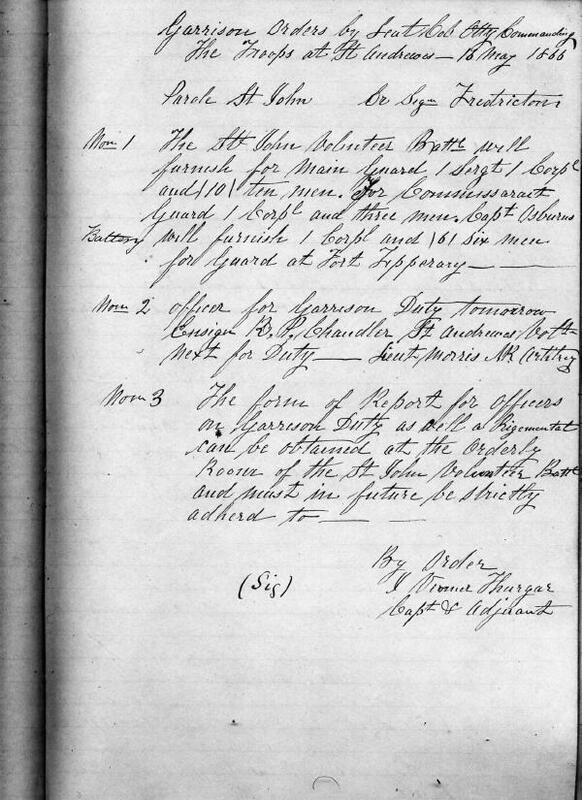 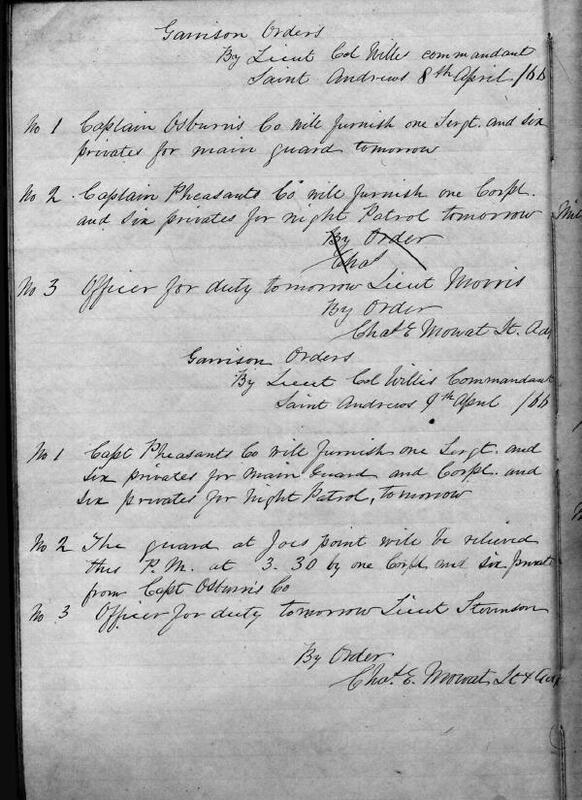 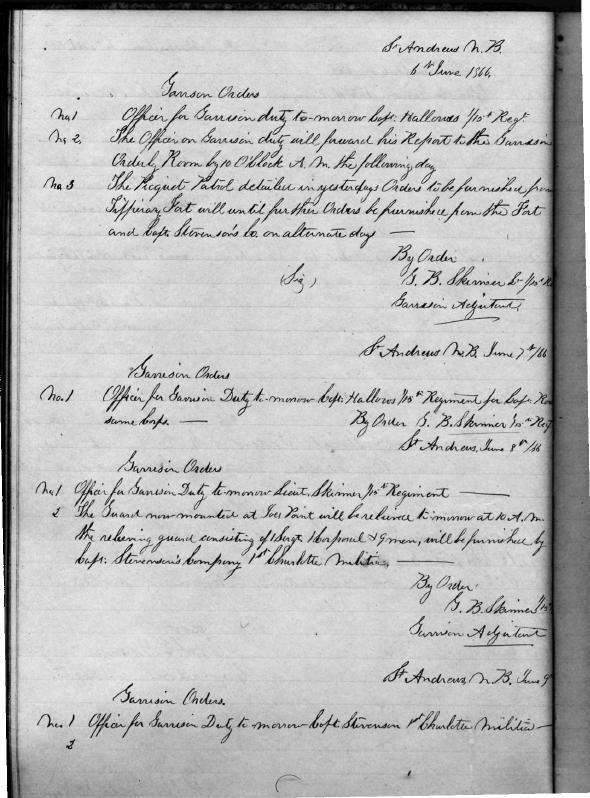 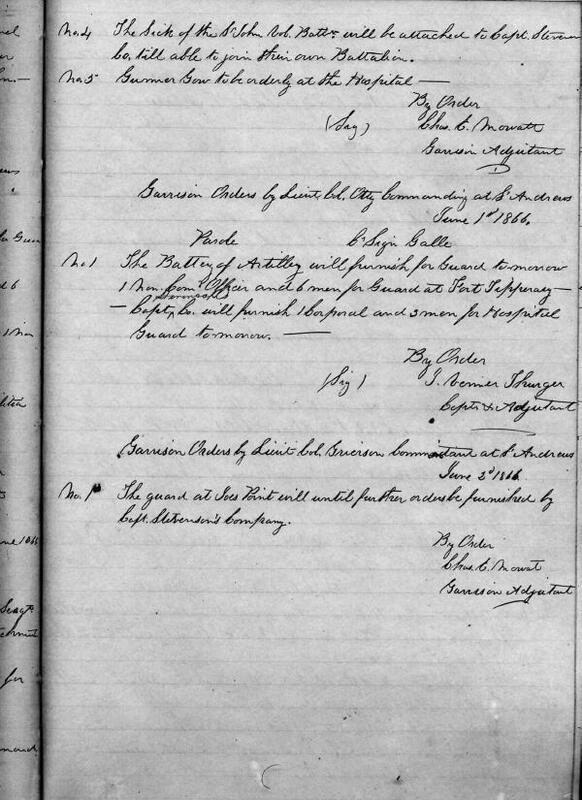 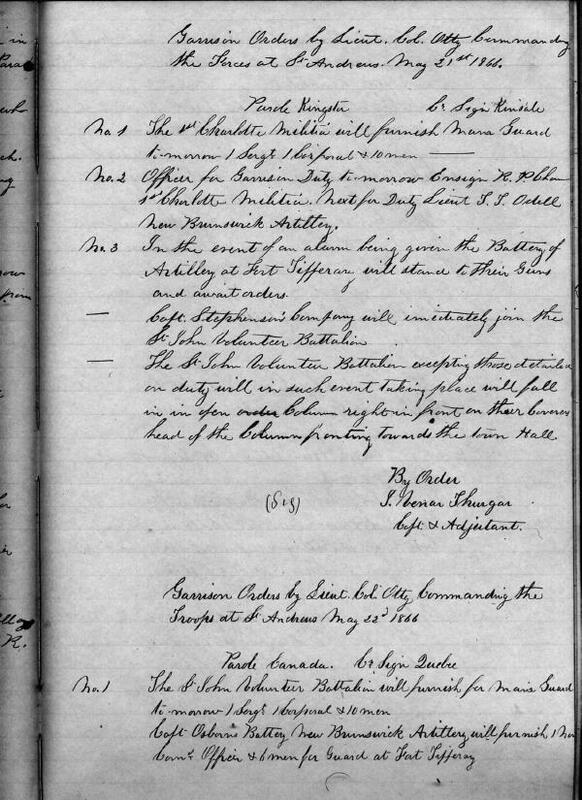 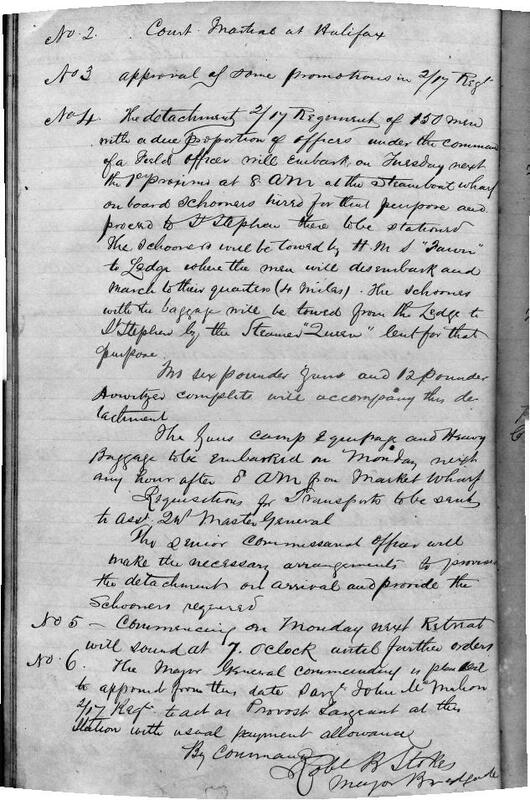 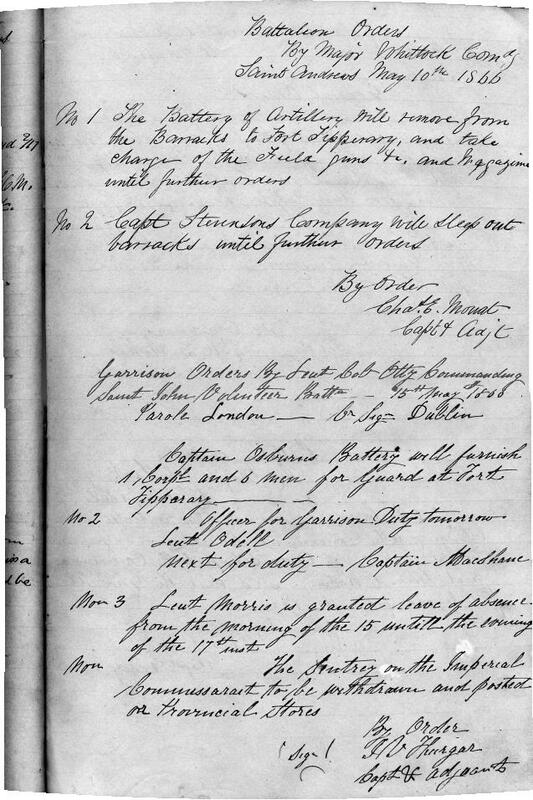 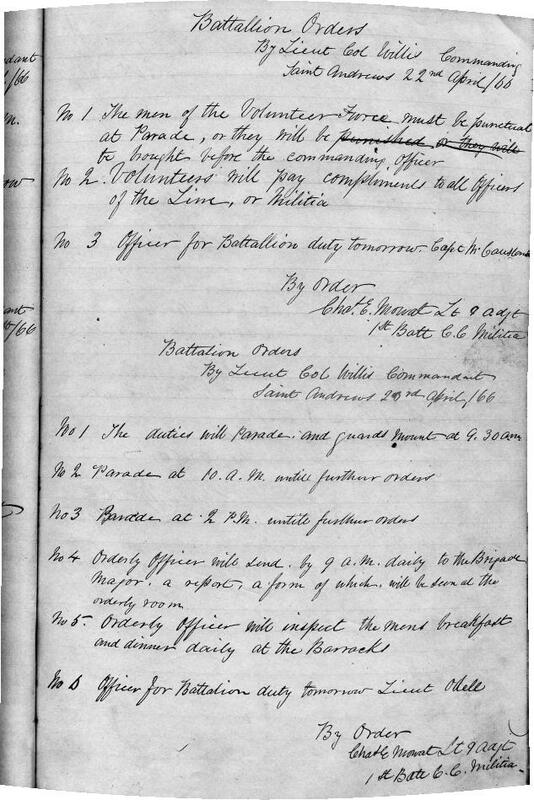 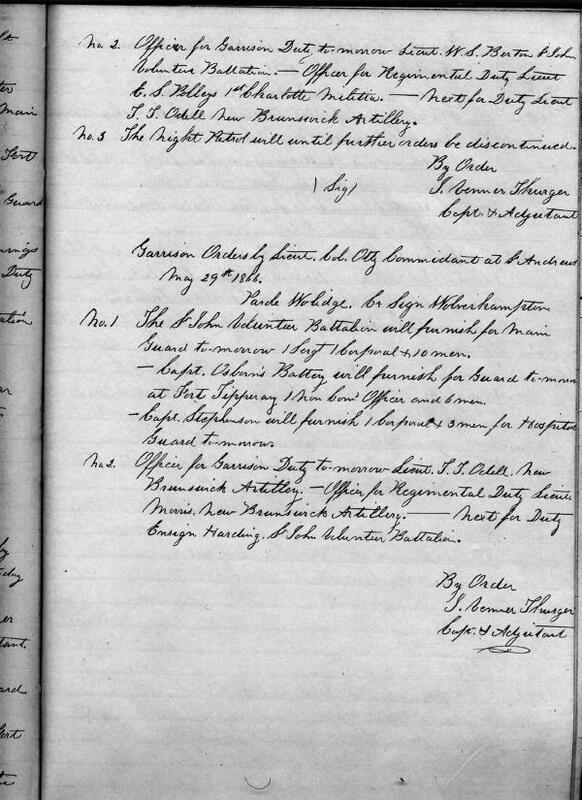 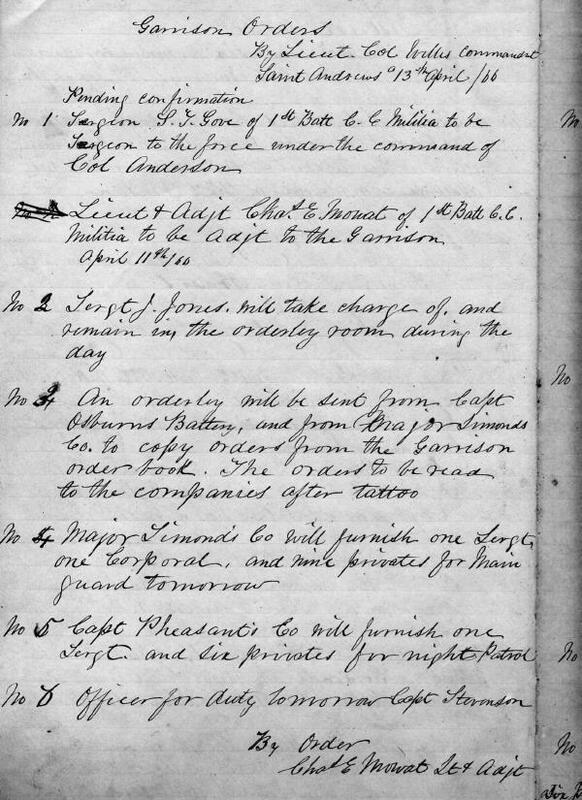 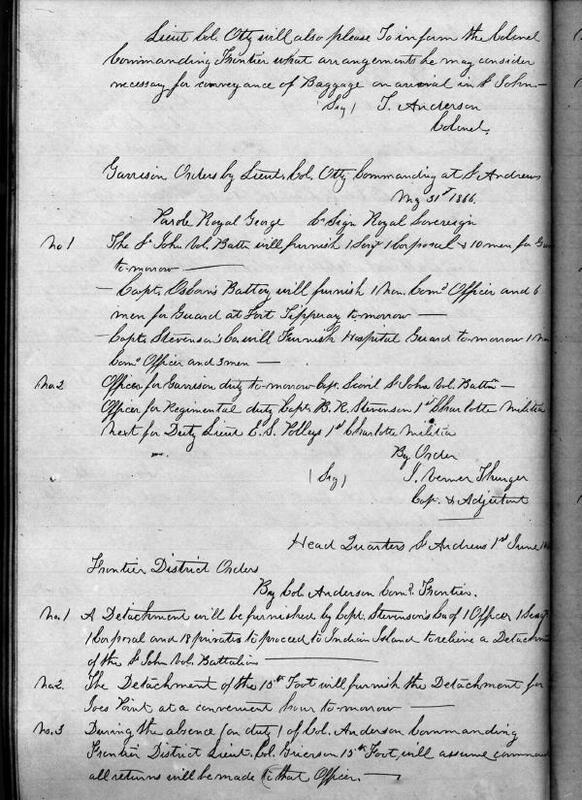 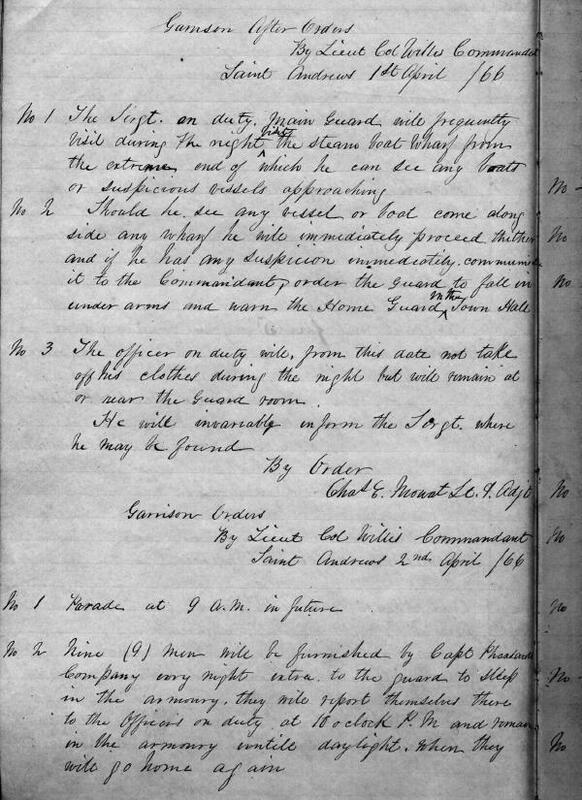 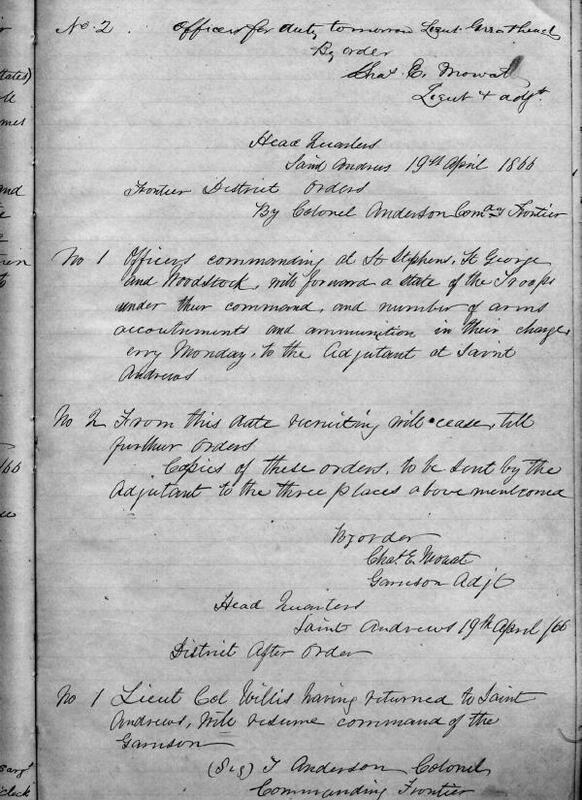 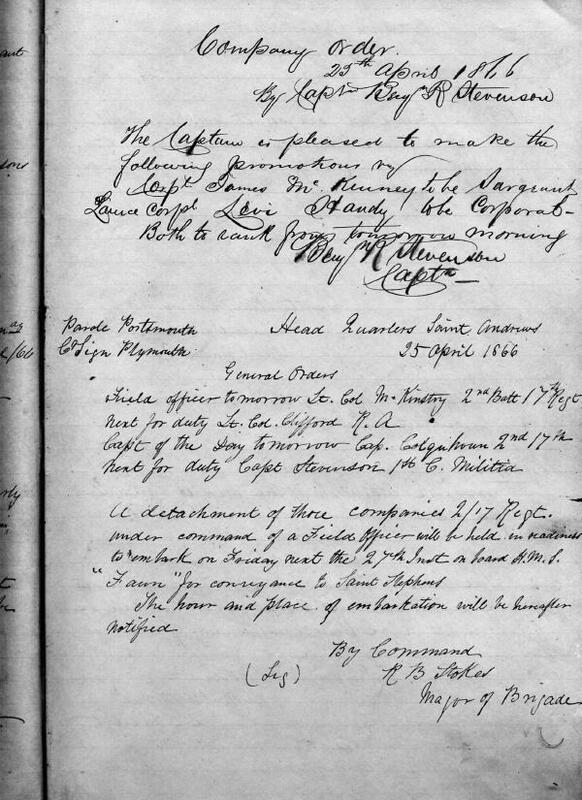 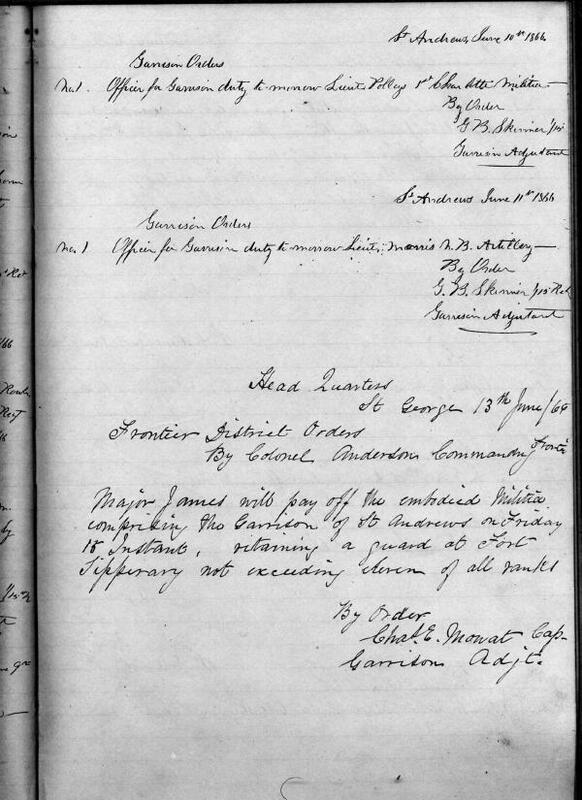 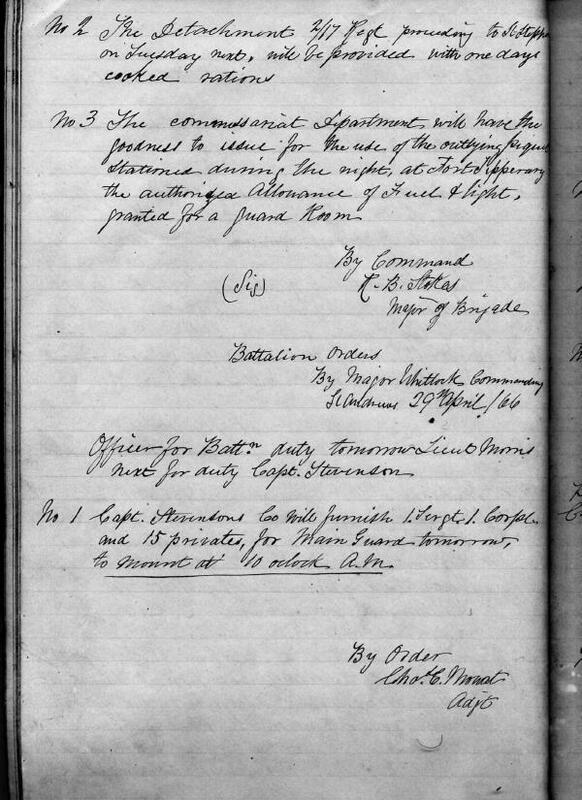 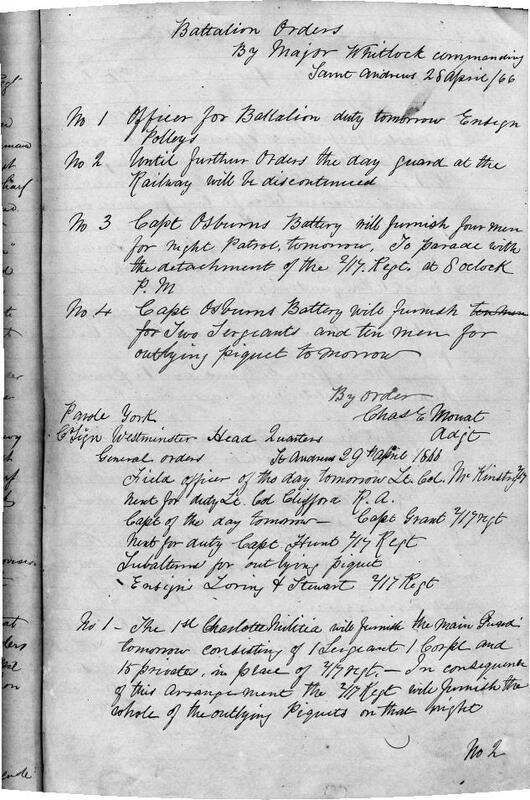 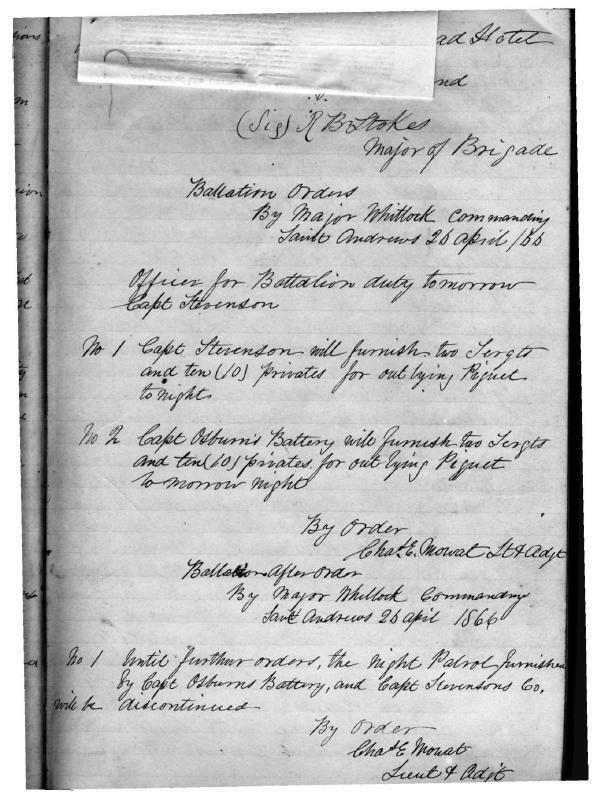 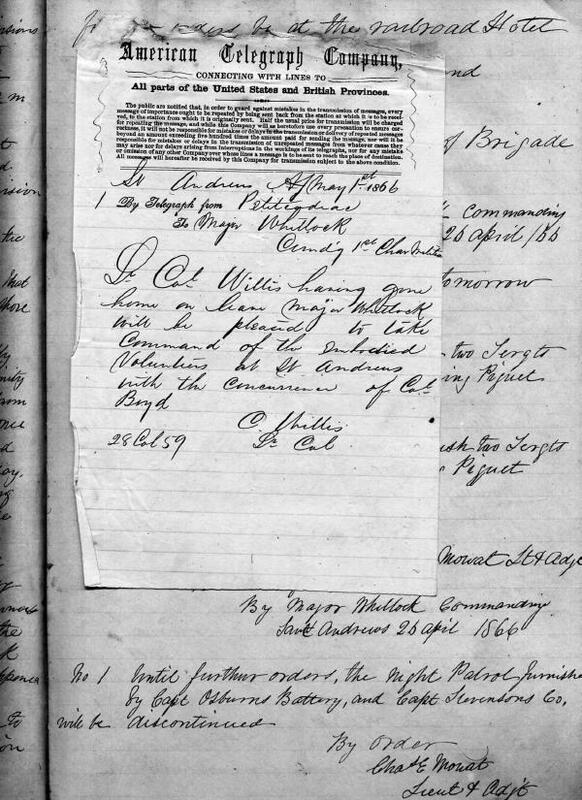 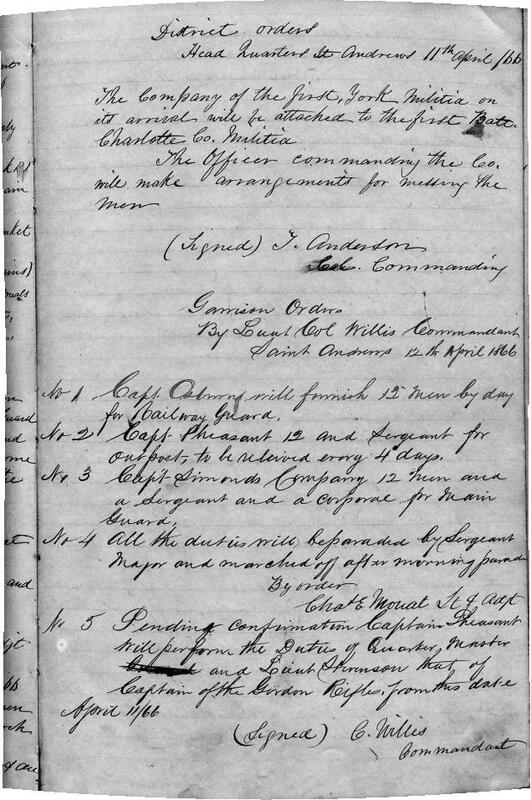 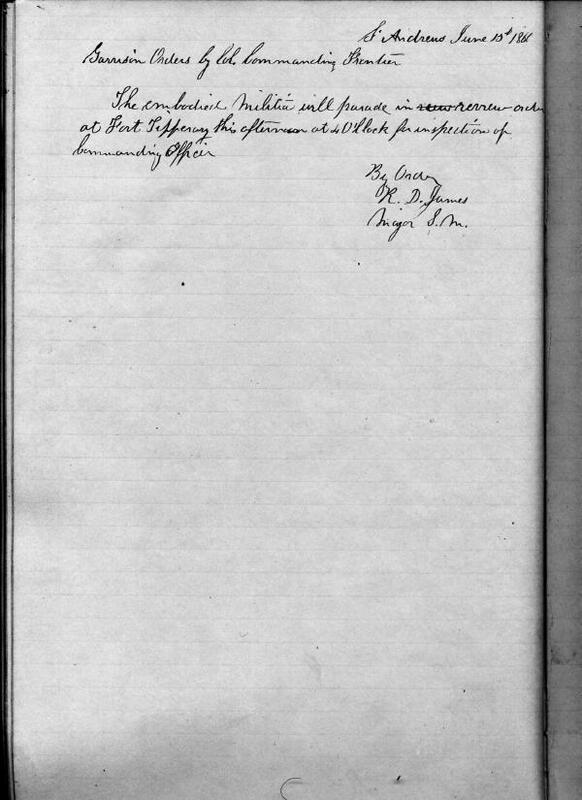 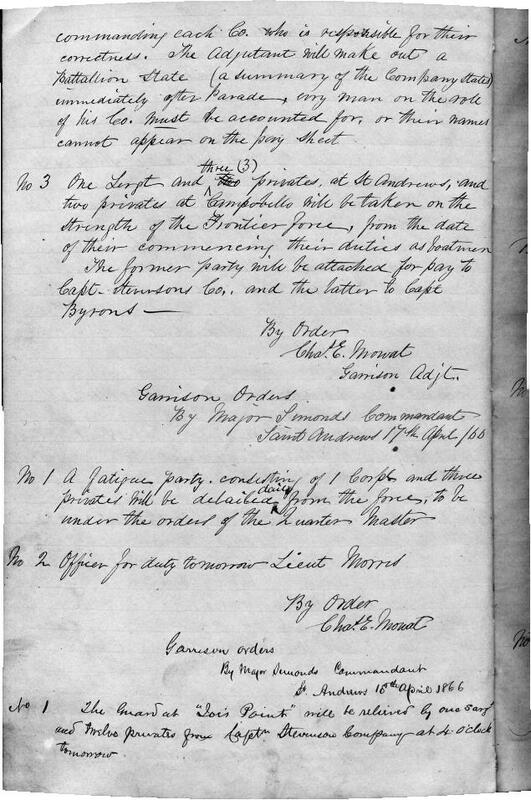 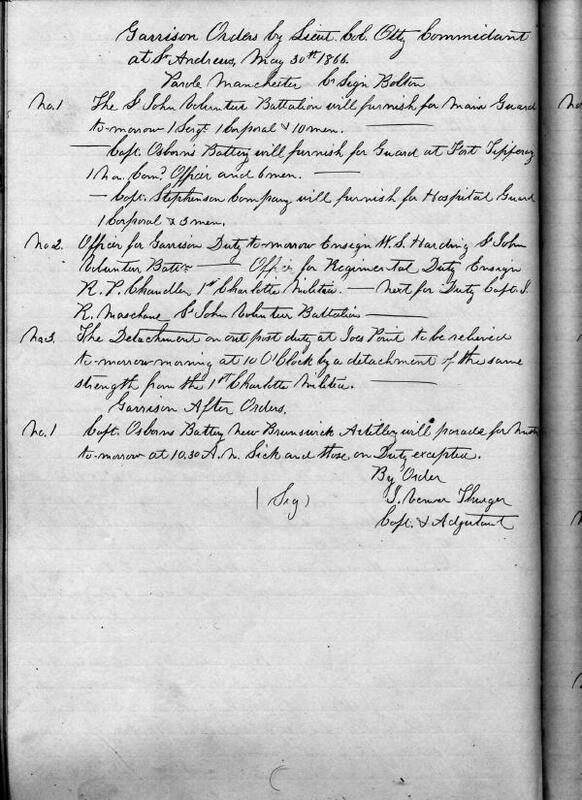 The local men who formed the militia that was embedded within the regular British forces kept a log book of Garrison Orders which is now in the possession of Sheila Washburn. 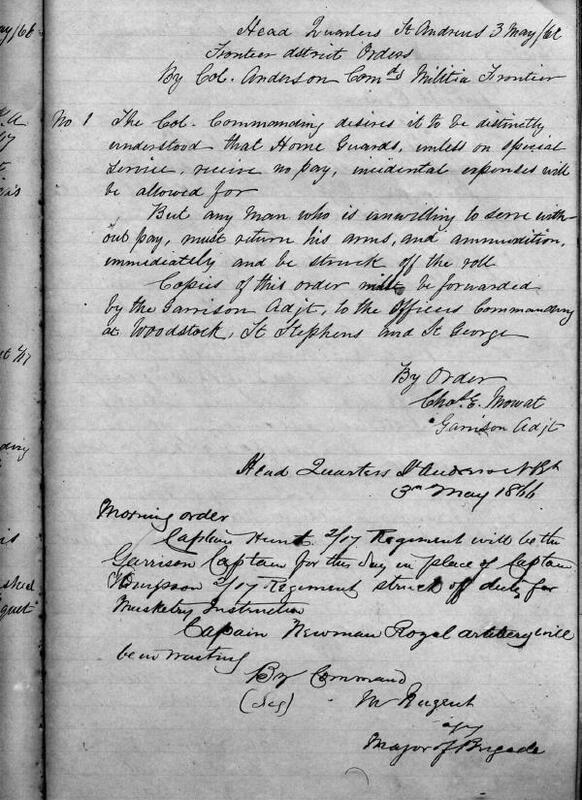 Neither its provenance nor how her father obtained it is known. 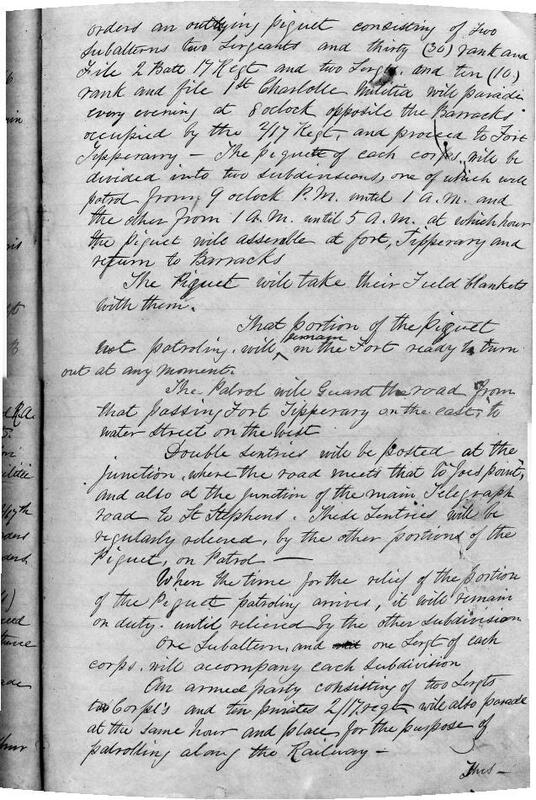 Click on the numbers below to see the corresponding scanned page. 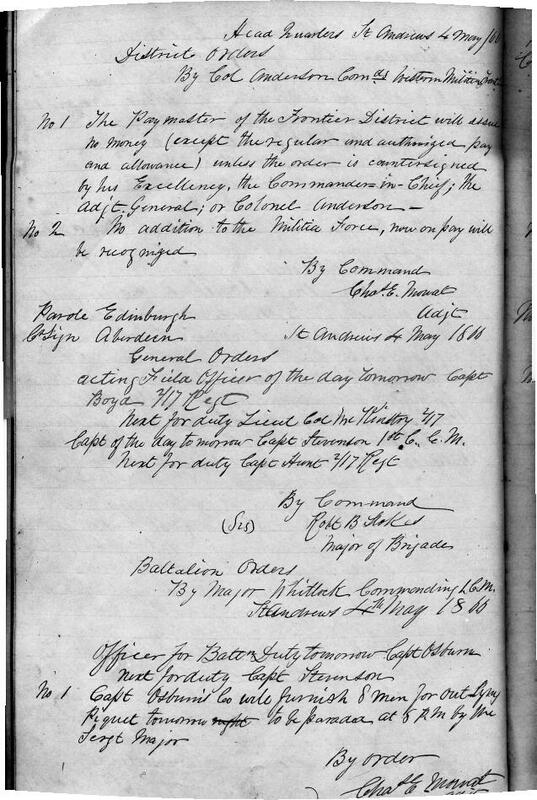 Scholar using this document will please give credit to the papers of late Earl T. Caughey of St. Andrews. 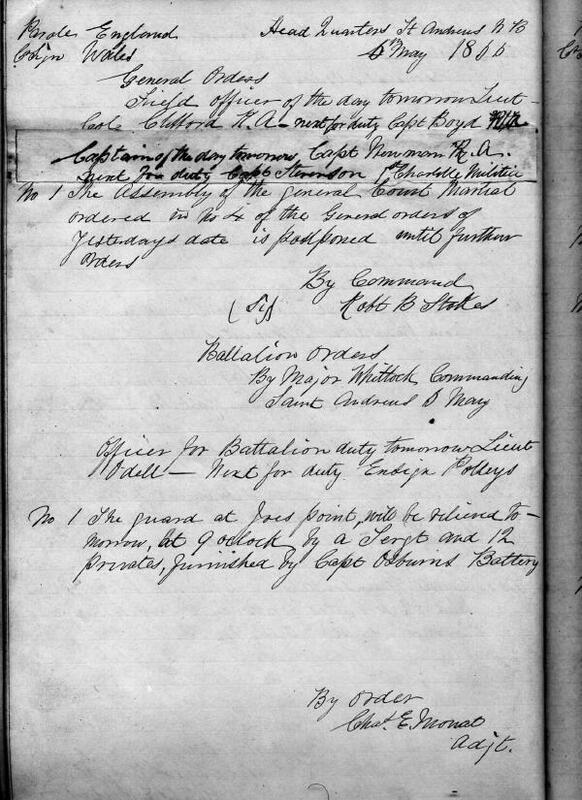 The Fenians accomplished more than they intended. 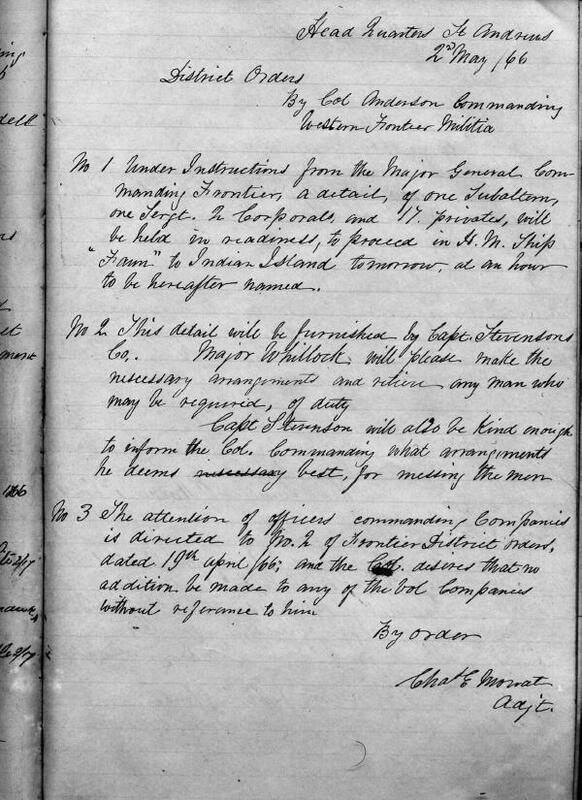 A pro-confederation government was subsequently elected in New Brunswick and, in 1867, the province joined three others to form the Dominion of Canada.